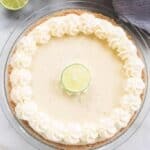 The easiest and BEST Key Lime pie! 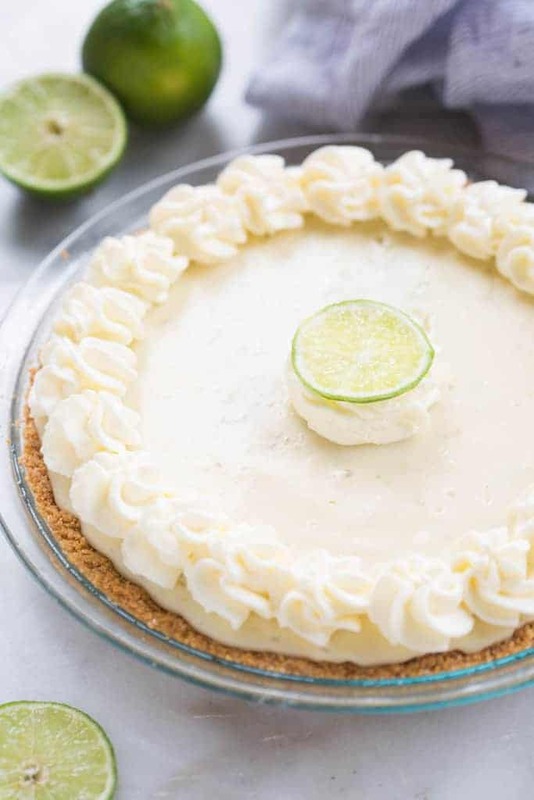 Creamy, luscious and perfectly tart Key Lime Pie with either an easy homemade graham cracker crust or a gingersnap cookie crust. There are so many classic recipes like this one that I really can’t believe I haven’t shared yet. Key Lime Pie! It’s one of the greats, and it’s a tradgedy that it has taken me this long to share it with you. 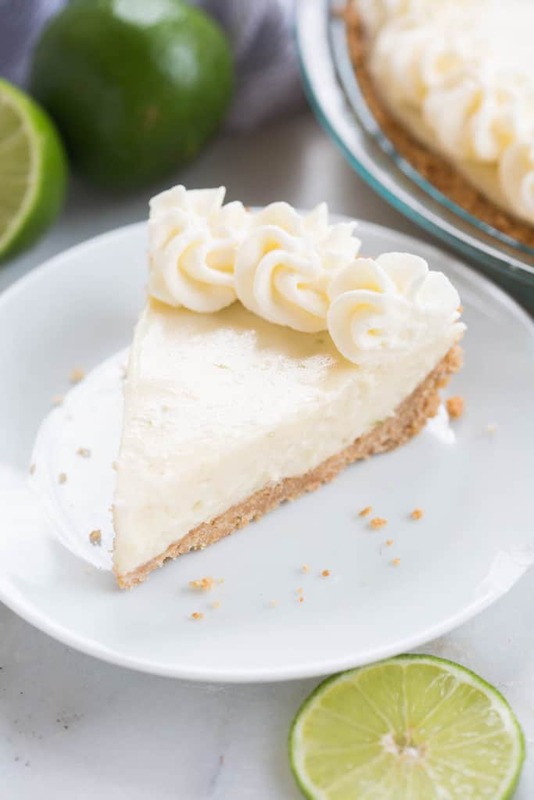 There are a few things that make this key lime pie recipe the BEST, some of which I share below. But one thing I really love is making this with a gingersnap cookie crust. The gingerbread flavor, especially around the holidays, mixed with the creamy key lime filling is delicious and makes a fun twist to the traditional version of key lime pie. The thing I love most about this pie (besides how creamy, luscious, and perfectly tart it is) is how incredibly EASY it is to make. Literally, the most amateur baker in the world could look like a rock star after making this pie. It’s so simple, and fool-proof. And please, PLEASE (this is me beggggging you) make the crust from scratch! There are some things you can get away with buying store-bought, but graham cracker crusts is NOT one of them. The store bought ones are flimsy and have no flavor. A homemade graham cracker crust is super duper simple and really makes a difference in taste. What is the difference between lime and key lime? While these are two different types of limes, the differences are subtle. The limes that we find in the store (especially in US stores) are called Persian limes. Key limes are very small (about 1 1/2 inches in diameter) and tend to contain more seeds than Persian limes and they also tend to have a more intense flavor. This flavor makes for an especially delicious pie filling. Key limes are sold more seasonal at the store and are not always as easy to purchase. Can I substitute lime juice for key lime juice? This recipe uses Nellie and Joes key lime juice, which is key lime juice, sold in a small bottle at most grocery stores. You can find it in a bottle next to the regular lime juice. If you have to, you could use regular lime juice (although I would only use freshly squeezed lime juice) and I hesitate to do this because the flavor of the pie wont be as good. There are 2 ways you can get key lime juice for this recipe. Juice about 20 of your own small key limes, OR use a bottle of Nellie’s Key Lime Juice! I always go for the latter. You should be able to find Nellie’s Key Lime juice at any of your local grocery stores, right next to the regular lime juice. It’s the stuff of gods and makes the pie making process soooo much easier, especially for those of us who don’t have access to fresh key limes. Use full fat cream cheese and sweetened condensed milk. The low fat options wont allow the pie to set up as well. The secret ingredient in this key lime pie is the cream cheese! 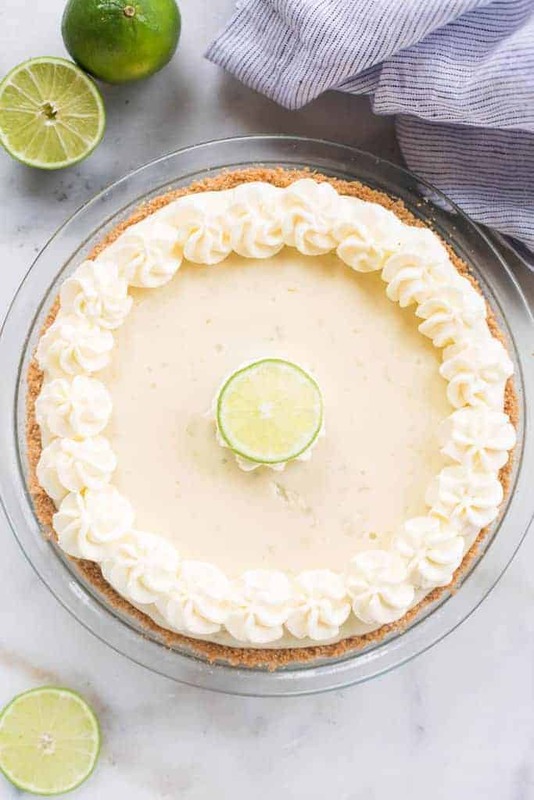 It’s not traditional in key lime pie (and you could substitute it for sour cream, if you feel like you have to), but it’s what makes this pie extra smooth, creamy and delicious! There are only 4 ounces of it–not enough to change the flavor, but just enough to give the pie an extra creaminess that puts it over the top! Don’t skimp on the lime zest in your key lime pie! Lime zest is a must for key lime pie! It gives the extra boost of flavor, and it adds little specks of green to the filling that help give the pie it’s signiture look. We love this pie with a traditional graham cracker crust, or with a gingersnap crust. Both are equally as fantastic, and I’ve added directions for the gingersnap crust in the notes below the recipe. Now go ahead and dig in to the BEST key lime pie ever! I’d love to hear if you make it, and which crust you use–comment below! Mix graham cracker crumbs, sugar, and melted butter in a small bowl. Pour crumb mixture into an 8" - 9.5" pie pan and press it firmly in the bottom of the pan and a little bit up the sides of the pan. Bake for 10 minutes. Remove from oven and allow to cool. Add cream cheese to a mixing bowl and beat well with electric beaters until smooth. Add both cans of sweetened condensed milk, lime juice, and lime zest and mix again until smooth. Pour into prepared graham cracker crust and bake in preheated oven for 10 minutes. Allow pie to cool for about 30 minutes, then refrigerate for at least 3 hours, before serving. Add heavy cream to a mixing bowl and beat with electric mixers for 1 minute. Slowly add powdered sugar and vanilla and continue beating until stiff peaks form. Spread or pipe the whipped cream on top of the cooled pie. *Don't miss my tips for making this pie turn out perfect, above in the post! Method, baking temp and bake time are the same as for the graham cracker crust. I’m making this for my son’s 13th birthday at his request. I usually make key lime cheese cake so I love the cream cheese ingredient…..I would also like to add sour cream for added tang. Can I use 2 ounces of each, cream cheese and sour cream or simply add a half cup or so of sour cream to your standing recipe? Can’t wait! Hi Jane, I really can’t say as I haven’t experimented with sour cream in this recipe, but I worry it would soften the filling and keep it from setting up properly. Great Pie! the only differnce, I made the crust half ginger snaps, half graham cracker, this is super easy and it came out beautifully! Is there really no eggs in this recipe? Most call for egg yolks.